We all love to plan something special for our best friends. The joy and excitement on our dogs' faces from even the smallest of surprises really is indescribable. With the fourth birthday of our twin Malinois on the horizon, we decided to contact the Waggly Club to trial their monthly subscription box. 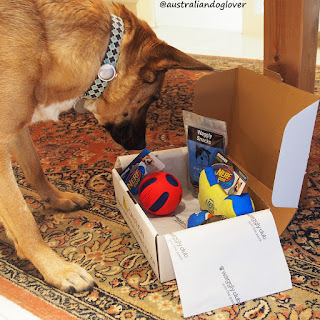 They exceeeded our expectations by despatching not just their standard monthly subscription box but also their latest offering for active chewers after we alerted the team to the "special needs" of our Maligators. Unfortunately, when busy with work and other commitments we often don’t have the time to shop and treat them as much as we would like. This is why pet subscription boxes - a specially curated box of goodies delivered to your door each and every month - are increasingly popular! WHAT IS THE WAGGLY CLUB BOX? Waggly Club is a monthly pet subscription box filled with high-quality dog toys and treats delivered to your door. 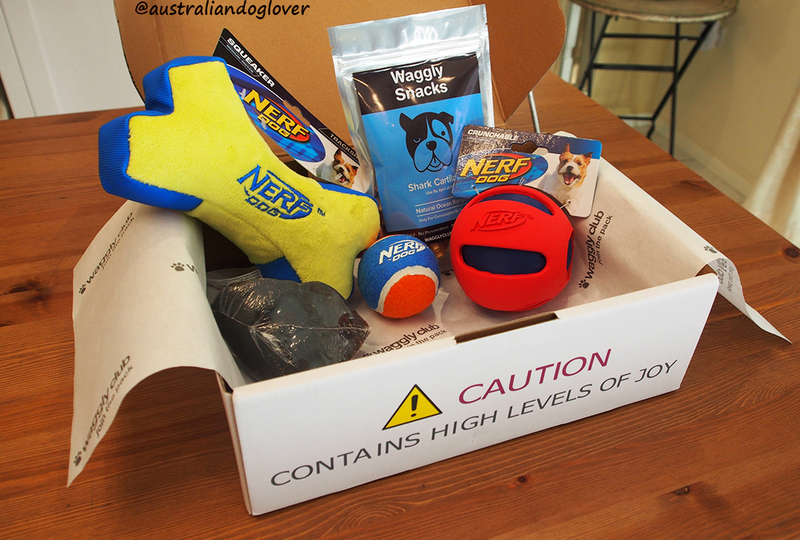 The contents change every month to keep things exciting for your dog and you! If you're new to this whole concept, it means that by subscribing to any of the plans, you’ll receive a new box of dog toys and treats delivered to your door, similar to a magazine subscription. Waggly Club also offer ‘one off’ boxes which have no subscription at all. These are great as gifts for friends and family or an occasional treat for your pooch. WHAT WAS IN OUR WAGGLY BOX THIS MONTH? With the standard subscription box, you can expect to receive each month 2 to 3 dog toys and 1 or 2 lots of healthy and tasty treats (4 to 6 items in total, tailored to the size of your pooch). Dog toys included are selected from reputable, safe brands, such as Kong, Outward Hound, Zippy Paws, Fuzzyard etc. The treats are usually low fat, high-value treats (jerky, liver etc.) which are great as a training aid to reward your dog. Aramis takes her job as chief taster very seriously and took time to inspect every item in this box with great care! 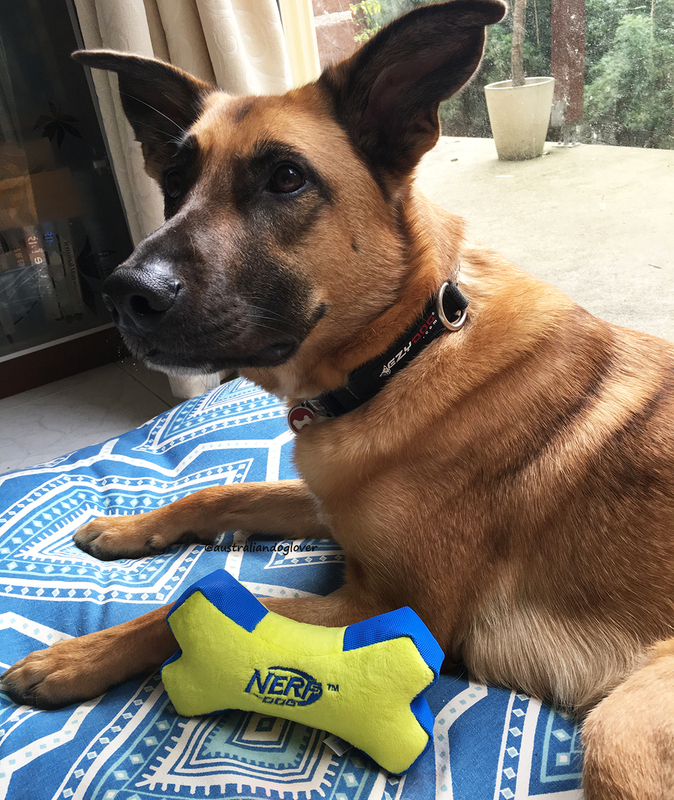 In our Game Day Box we found three dog toys from NERF Dog including a colourful Nerf Blaster - a standard tennis ball; a Nerf Crunchable - a larger ball made of rubber outer with a crinkle interior and low volume squeaker. Also included was the Nerf Trackshot, a larger and more durable plush dog toy in bright yellow/blue which also comes with a squeaker. The stitching is three times stronger than in a standard plush in this specialty line however it would not survive a tug-of-war between our Malinois so we opted to gift this one to our our senior dog Conner who's now (a little...) more gentle with his toys! However what our dogs showed the most interest in were the dog treats with an interesting combination of "surf and turf". 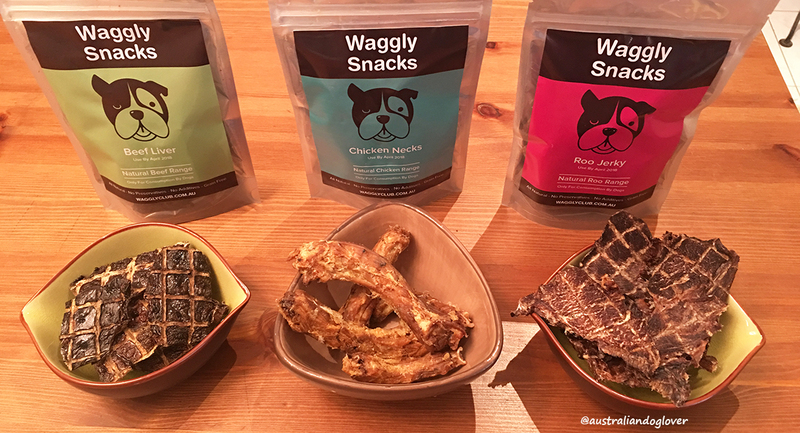 As is now the case with most subscription box providers, the Waggly Club procure their own range of treats and our dogs first sampled their Shark Cartilage treats - dehydrated to lock in the nutrients, with no preservatives or additives. To their utmost delight, these were extremely odorous and deliciously crunchy under tooth and the first ones were devoured within seconds! 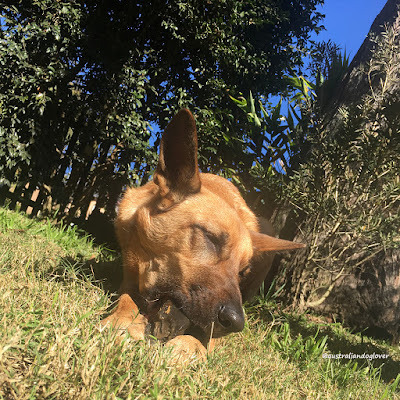 The Cow Hoof filled with a natural, grain-free kangaroo filling constitutes a great healthy treat to leave in the morning, as this should keep your dog occupied for a while. We then let her siblings out in the garden and rumour has it that the cow hoof is now buried amongst our spring bulbs! Our review happened to coincide with the Waggly Club introducing their newly redesigned packaging box in bright purple delivering - in our opinion - much stronger branding, and you can expect to see this new style in coming months. June saw the introduction of an option specially designed for the "Active Chewer" in your life... Because this box includes a premium durable dog toy, the trade-off is that you'll only get one toy plus three healthy dog treats from the Waggly Snacks range. We'd never heard of the KONG Goodie Bone previously, but it is yet another durable chew toy you can stuff with treats, pastes or peanut butter. We received one in a Large size, which suits dogs from 13-30kg, which placed us at the upper limit! 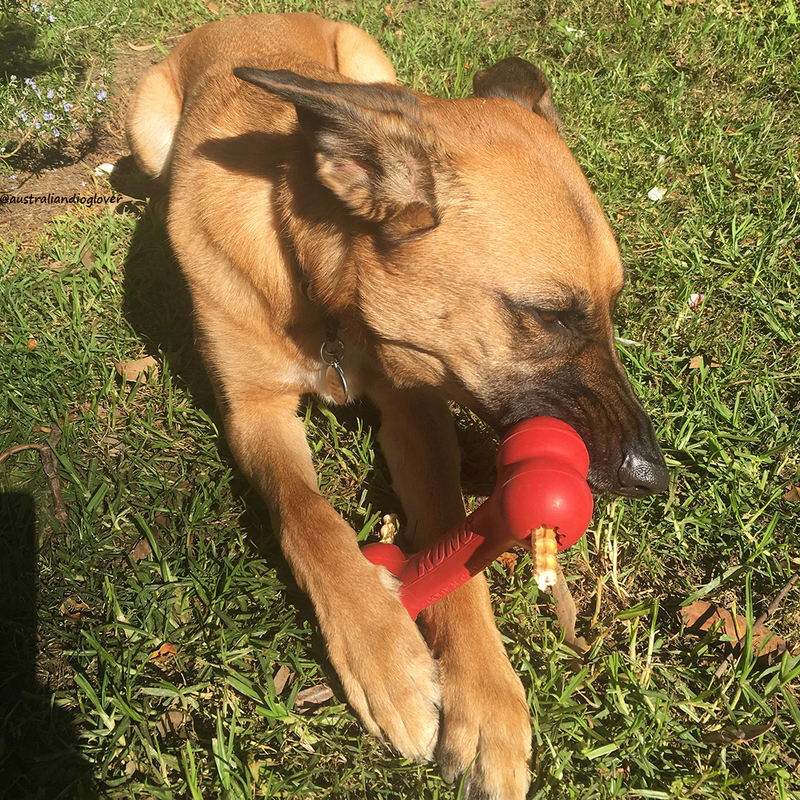 The oddly star-shaped slots on both ends are too large to hold normal size kibble or treats but luckily we found that the stick-shaped Shark Cartilage from our other Waggly Club box worked a treat! To make it up to Porthos for missing out earlier on that delicious cow hoof, he was invited to test out the Goodie Bone and he promptly snapped off the ends of the treats sticking out! 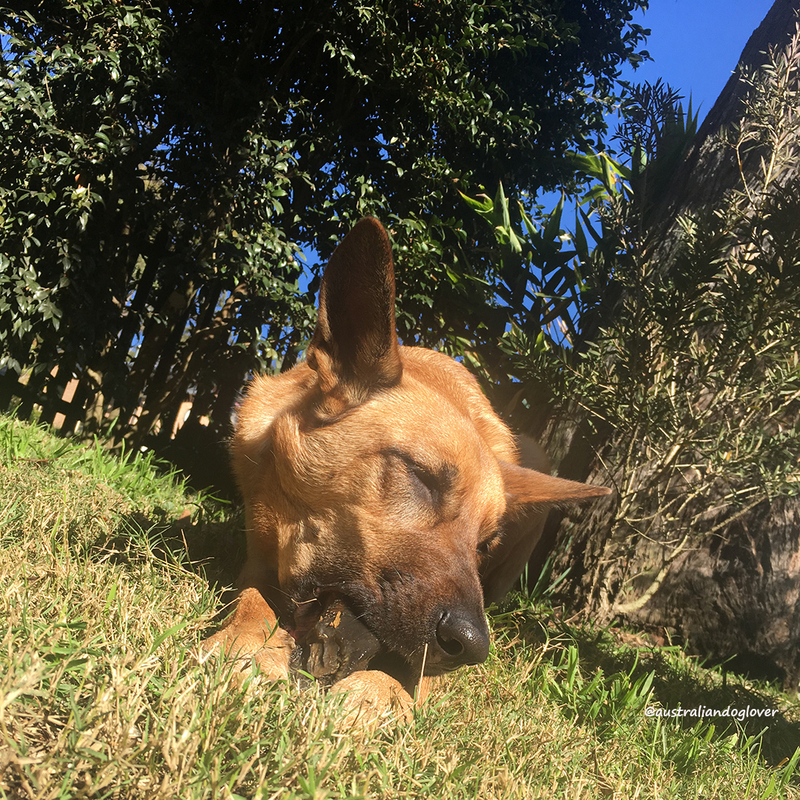 Beef Liver - a classic dog treat which is easy to snap into smaller pieces for your training sessions so a little goes a long way! Roo Jerky - a favourite of any dog, they're easy to break down into small chunks so perfect for the training pouch. All these treats (including the mince filled cow hooves, shark cartilage etc.) and some of the dog toys featured in previous monthly boxes can be purchased separately via the newly launched Waggly Club online shop. RRP: from $45/month (6-month subscription), $50/month (3-month) or $60/month (one-off box). You can upgrade to the 'Active Chewer' option - which includes a premium tough - for $5 more per month. All these options include free shipping Australia wide.